Widening I-5 actually increased crashes, instead of reducing them, and an even wider freeway won’t be less congested if crashes don’t decline. 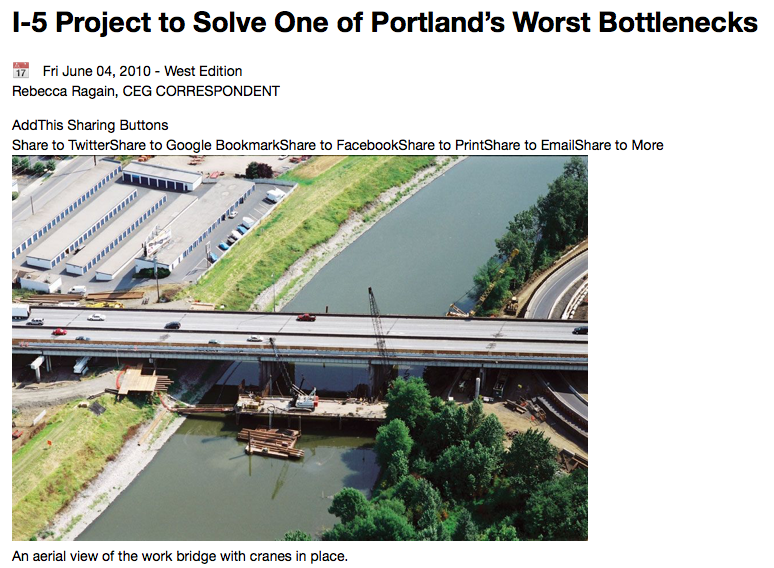 We’re going to dig deep into Portland’s proposed freeway-widening controversy today, and in the process we’re going to get into some very wonky traffic engineering details. Here’s the background: the Oregon Department of Transportation is proposing to widen a mile-long stretch of Interstate 5 through Portland, at a cost estimated approaching $500 million. ODOT is offering up a shifting array of rationales for the project. While they conceded that the project won’t reduce the regular daily traffic jams due to induced demand as we pointed out earlier, they argue that it will relieve congestion due by reducing crashes. The theory is that a wider road will have fewer crashes. The project’s advocates have acknowledged that widening I-5 will do nothing to reduce the daily backups on I-5 that are associated with the heavy flows of commuter traffic. Instead, they’ve build the case for this project on its ability to reduce what they call “non-recurring” congestion–the delays associated with back ups due to crashes. (For traffic engineers, congestion comes in two flavors–”recurring” and “non-recurring”. “Recurring” congestion is the predictable daily (usually twice daily) slowing on a roadway that’s associated with the heavy demand from regular flows of commuters. “Non-recurring” means unusual congestion, the kind that’s associated with crashes, construction slow-downs or bad weather. While the distinction is almost certainly irrelevant to those of us stuck in traffic, its an essential part of the justification for this $500 million project. Superficially, it’s plausible theory, but is it true? The best evidence of whether the ODOT theory is right is an actual experiment. What happens when you widen a stretch of urban freeway like this one. Do crashes actually decrease? As luck would have it, we have a timely and close-by real world experiment to examine. In fact, this experiment is on the same roadway, in the same city, and involves exactly the same kind of improvements, designed to solve the same kind of problems. In 2009, the Oregon Department of Transportation spent $70 million widening a stretch of Interstate 5 between Lombard Street and North Victory AVenue. They added a third lane to one side of the freeway, and widened shoulders on both sides of the freeway. The ostensible purpose of the project was to alleviate congestion and reduce the fender benders that created non-recurring delay. So if a wider freeway results in fewer crashes, we ought to see it in the data. Let’s take a look at ODOT’s crash data for this stretch of Interstate 5. ODOT reports crashes on a roadway segment that runs from Lombard Street to the Oregon/Washington border; the project in question represents about half of this segment. Here are the ODOT data on the number of crashes in this roadway. The data show that prior to the project, this stretch of roadway experienced about 1 crash per 1 million miles driven, with some fluctuation from year to year between 0.9 and 1.1 crashes. Perhaps unsurprisingly, during the project construction period, which included calendar year 2010, the crash rate went up. After the project was completed, the crash rate came down, but has averaged about 1.1 crashes per million miles traveled, perhaps about 10 percent higher than the pre-construction equilibrium. The important point here is that widening this particular stretch of freeway didn’t do anything to reduce the actual number of crashes recorded. If anything, the crash rate went up. That’s got a very important implication for the proposed $500 million Rose Quarter I-5 widening project. This real world experience shows that more lanes and wider shoulders–on this very same freeway, carrying many of the same vehicles–does nothing to reduce the real world crash rate. What this means is that neither of the supposed traffic improvement rationales for the I-5 widening project are supported by any evidence. The well-known effect of induced demand means that regular daily congestion will continue–a fact that state and local agency experts concede. 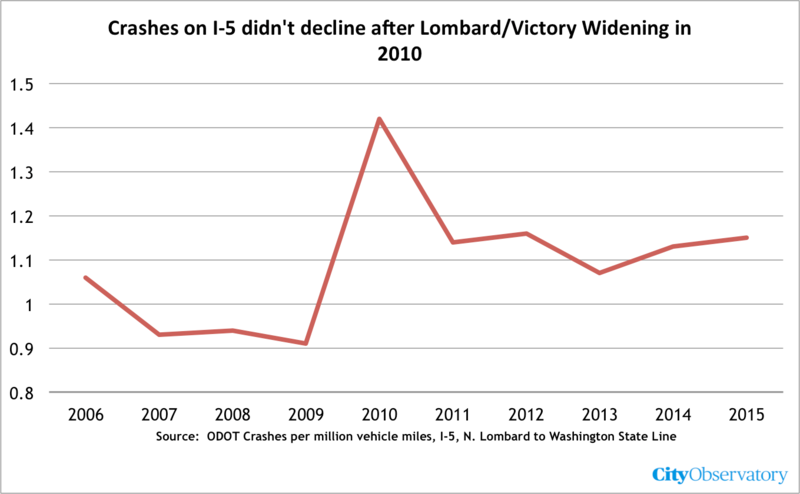 Their claim that a wider freeway will somehow reduce crashes isn’t borne out by the actual evidence from ODOT’s last experiment with widening I-5–on a segment of road that carries virtually the same traffic and had (until 2010) the same kind of bottleneck. Instead, widening the freeway increased crashes. Because it will reduce neither recurring non non-recurring sources of congestion–and may actually make them both worse, it makes no sense to spend half a billion dollars on this project if the objective is to reduce congestion.